Ecozone is an innovative eco-friendly cleaning brand based in the UK, focused on helping you reduce the amount of toxic chemicals in your home and cut-down household CO2 emissions to make your home an ecozone. These ideals mean the brand is always pushing the limits to create the most eco-friendly everyday products that are also effective and efficient. The Magnoball is designed to effectively remove and prevent limescale forming in your washing machine or dishwasher, without using any chemicals. Instead the powerful magnet works to crystalise the limescale so that it can’t stick to clothes, pipes or heating elements, it simply washes away. Not only is that much better for your machine, ensuring it has a long and happy life, it also means you’re not using nasty chemicals to clean up, which also saves you money on regular cleaning products. 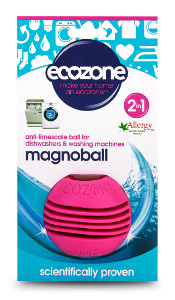 The Magnoball also makes it possible to use less detergent in your washes, reducing it by up to 70%, and no more anti-limescale tablets either! This environmentally safe limescale remover is a must have for your household, saving you money and saving the planet. It has a guarantee of 5 years and it won’t let you down! Ecoballs are a revolutionary alternative to regular laundry detergent because they clean your clothes using minerals, ionising the water allowing it to get deep into your clothes and lift the dirt away. This means no toxic or harsh chemicals and no need for a rinse cycle! Lasting for up to 1,000 washes, the Ecoballs work out cheaper than 3p per load (where regular washing powder costs approx. 25-30p per wash) which saves money and without the rinse cycle your machine uses less energy too! Since there are no harsh chemicals they 100% hypoallergenic and antibacterial and not tested on animals. Simply add your washing to the machine, place 3 Ecoballs on top of the load, select the desired temperature (below 60°C), and you’re good to go! Ecoballs have also been voted one of the Ten Best Green Household Products by The Independent. Keep your loo fresh and clean with the Forever Flush! 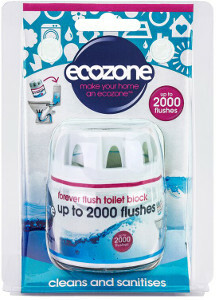 Simply place the toilet freshener in your cistern where it can stay for up to 2000 flushes. The Forever Flush helps prevent stains and limescale in your toilet and leaves it sanitary, stain free and deodorised. The Forever Flush toilet block is non-toxic, cruelty free and biodegradable which means it is suitable for septic tanks too – a much more environmentally friendly alternative to regular toilet fresheners. What are your favourite Ecozone products? Let us know in the comments below!